Summer is coming… are you ready? Are you excited to get outside and start moving more, but know you need to improve just a bit physically first? Have you ever fully intended to start something good for yourself, like taking Pilates or walking regularly, but found it impossible to make the time to go; to fit it into your schedule? You already know, or maybe you’ve heard, how good it makes you feel, both in body and mind. And you know how rewarding that sense of achievement is after you’ve completed a class, a session, or just gone for a nice long walk. And yet, getting down to the studio has just never quite made it to the top of the to-do list. And every single time I overcome the inertia of staying put, I feel 100 times better and want to keep going. And, if I can keep it going long enough, I get the coveted momentum going and I don’t want to stop and I suddenly have a new great habit. As soon as you set your intentions and start, you immediately gain momentum and that momentum makes it just as hard to stop as it can be to start. The Tonic instructor crew has been talking a lot about what we can do to help you create momentum in your movement practice, both inside and outside the studio. We’ve also talked a lot about how we can better support you in starting, or taking your movement journey to the next level. We put our heads together and came up with a fun and effective program that I think you’re going to love to help you get your momentum going. Starting today, we’re accepting registrations for a new 3-week program available for studio members which starts April 22, 2016. 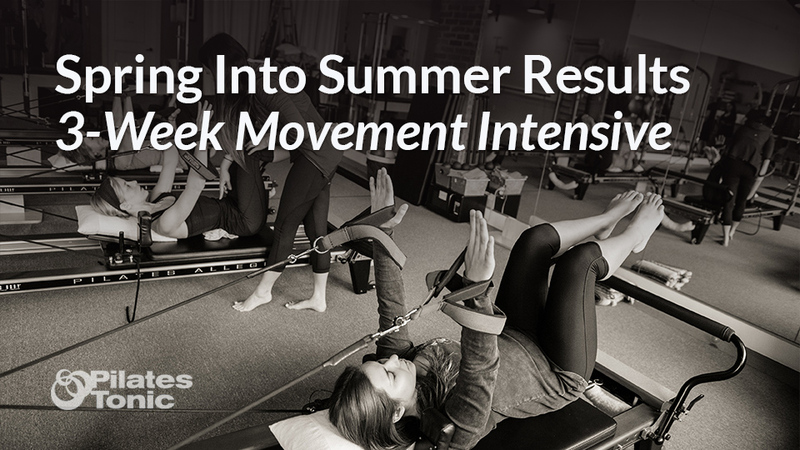 The program is called, Spring Into Summer Results: 3-Week Movement Intensive and we’re going to show you how to get up, re-align, and start moving optimally so you can get serious results from your exercise program and be ready to really enjoy your summer! Pricing and registration links are below and we’re currently accepting a limited number of participants since we’ll be working closely with you during the program and want everyone to have as much attention as possible. In order to fully embody new movement patterns and new alignment, it helps to practice and hear new ideas more frequently. Your goal for this 3-week intensive is to build your momentum by coming to the studio three times a week for three weeks. At the end of the program, you’ll have a great new set of movement habits. We want to make it easy to keep moving! To maximize your opportunity to attend all your classes with ease, we’re adding Saturday classes back to the schedule during the three-week Spring Into Summer program. As a bonus for participating in the Spring Into Summer Results: 3-Week Movement Intensive, you’ll also receive a free spot in my upcoming Improve Your Gait & Balance and Save Your Knees class (A $45 value!) happening on Saturday, May 14th from 10:00-11:30am! As soon as you select and purchase your intensive package, you can schedule your classes and/or private sessions. You’ll just need to scroll forward to April 22nd on our MBO calendar, or click here to go directly April 22nd. Q: I am new to Pilates Tonic can I still participate in the Spring Into Summer Results: 3-Week Movement Intensive? A: Yes you can, after attending 1 Studio Foundation session. Everyone new to the studio must take a Studio Foundation session first. So, all you need to do is schedule your Studio Foundation session ASAP. During your session, your instructor can help you decide which package will be most beneficial for you. Q: I have taken mat classes at the studio, but have never taken a reformer or equipment class. What do I need to do to take reformer classes? A: Equipment/Reformer Classes and Monkey Gym require a private session first in order to be cleared for these classes by an instructor. You can register for a private session here. Q: I am going to be gone one of the weeks. What do you recommend I do about the classes that week? A: The classes you receive for the Spring Into Summer Results: 3-Week Movement Intensive may be used however you need to during the 3 weeks. So, if you need to double up on classes one week and take fewer classes the next, that’s no problem. We just want you to get your classes in during the 3 weeks. Q: I already have an existing package of classes. I’m afraid they are going to expire while I’m taking the Spring Into Summer Results: 3-Week Movement Intensive. A: We understand. If you already have existing packages, we don’t want you to lose anything. We freeze whatever current classes you have on the day the Spring Into Summer starts. As soon as the Spring Into Summer Results is over, we re-activate your prior classes. You have the same amount of time left to use the classes that you had before the Experience started. Q: I don’t see times that work for my schedule for private sessions. Are there other times available? A: Yes! There are times that instructors are available, especially evenings, that don’t show up on MBO. Email us with the time you’re looking for and we’ll let you know if it’s available.